I’ve been off work for the past few weeks, on paternity leave. It’s been a wonderful time, for all the obvious reasons. One unintended benefit is having such a long, concentrated spell in the place you live. Instead of the tube ride to work, the office, client’s offices, other agencies, it’s been an unexpectedly pleasant surprise to have my daily footprint dramatically reduced to an area or routine that only covers my children’s school and nursery, local shops, and neighbours’ houses. It’s disruptive in the best possible sense. You start re-noticing the stuff all around you – the good and the bad. You have the time to do all those things that help you to feel part of the community, like chatting with the other parents after school. I also – finally – got around to going back to a local bookshop of ours. It’s called the Big Green Bookshop, and it’s just off the Wood Green High Road – a most unlikely location for a community-minded, bohemian-ish and pretty much unsustainable (in these times) little bookshop. This time round I actually bought a couple of books, too. The strange thing is, I did this pretty much because they asked me to. Someone on the school PTA is on the shop’s email list, and she sent round their ‘plea’ newsletter. It stated that if they had another nine months like the nine months they’d just had, then they would fail their bank loan and be forced to sell up. You can see what they wrote in full here. Like many others who read it, I immediately felt obliged to get round there and spend some money. But why? Surely this is what most businesses do? They persuade people to part with their cash – it’s just that most do it with more subtlety, or feel they need to maintain the pretence that nothing so dirty as a financial transaction is going on. Arguably, this is quite possibly the most nakedly transparent ‘spend money with us’ campaign you could conceive, as it lays bare the mechanism of credit repayments that allows a business to exist. And yet it’s not just me. The local paper used the story on their promo material in newsagents. ‘Shop appeals for customers’ doesn’t sound like it should be a front page story, even for a local freesheet. 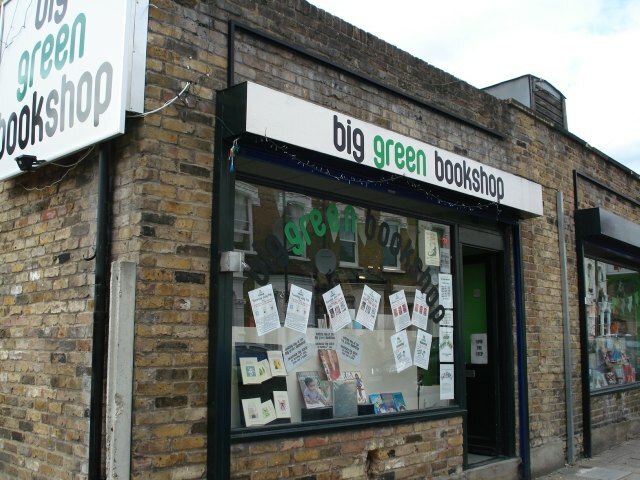 The more I found out about the Big Green Bookshop, the more I felt their transparency with their customers was not just warranted, but appropriate. Everything they do is designed to add value to their customers and the community in which they live. The plea was a fantastic way to ‘level’ with the very customers they’ve provided so much service for previously, as befits a place that was set up in the wake of a previous venture (the Waterstones up the road) that was unceremoniously shut down, leaving the wave of Wood Green middle-class gentrification with nowhere to buy their paperbacks this side of Crouch End. The shop’s facebook page and blog invite customers in to the running of the shop; they run book launches and events; the last Sunday of each month is Board Games afternoon; last week they even hosted their first open mic stand-up night. Openly asking people to buy more books is just the most straight-forward way of asking people to reciprocate. So, people’s goodwill to the brand (for a brand it undoubtedly is) and its audaciously uncomplicated request stems from the way it has previously invested in its reputation and in innovative ways to service its customers. Standard purchases are imbued with some sense of added value because of how the shop has articulated its identity. The campaign is a brilliant example of how a focus on your existing customers can be ‘overheard’ and lead to new business. The latest blog post says web traffic has grown from its usual level of 1500 hits to 30,000 in the last couple of weeks. People, like me, who had always meant to pop in are now buying books. Suppliers are under pressure to turn round orders. All this from a smart and efficient deployment of Owned channels, and a leveraging of Earned communication. Specific, actionable tactics have given customers a really simple way in – ‘Buy an Extra Book’ week is as obvious as it gets, but it’s working. Knowing how people like to see their contribution count, the guys supply frequent updates of how the shop is doing against its stated objective, with this really neat ‘strugglometer’. The shop’s cause, of course, has context. When bookshops are disappearing everywhere, having a local independent bookshop says something about your community. A certain type of person will believe the existence of thisbook shop A Good Thing, so the opportunity to help save it is an appealing prospect. This isn’t cheating, it’s just knowing your customer base, and what motivates them. The ‘appeal’ campaign can be a winner. We know from loss aversion theory that people will work very hard to cling on to something they already have – when this sense of missing out is amplified by the threat of generic extinction it becomes very powerful indeed. Perhaps, as with the music industry stuff I talked about here, it’s only a company with its back to the wall that’s brave enough to go out and do this sort of thing. When there’s an imperative to actually be relevant to your customers because otherwise you might go out of business, it’s somehow less hard for stakeholder second-guessing take over. Or perhaps, to quote Simon Waldman again, we’re about to see a supposedly outmoded technology enjoy one of those late surges that occur when obselesence hits. The classic example is the way LoveFilm and box sets have revealed the fallacy of DVD’s capitulation to video streaming – it’s arguable DVDs have never been more popular, just as supposedly ‘better’ formats are now available. 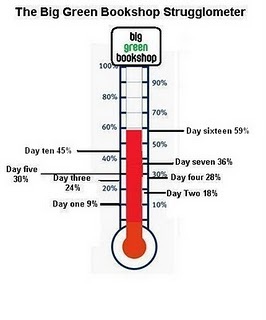 Similarly, aligning the bookshop’s campaign with World Book Day highlights the romantic attachment to books as objects as one that will take a while to totally shift. I’m sure I’m not alone in not quite being able to give myself over to digitised reading in the same way as I’ve finally accepted its musical equivalent. I wonder whether as Kindles and other e-readers become more popular we won’t begin to see the fetishisation of books take hold – I’m convinced this lies behind a lot of the campaigning against library closures too. All of which in turn might allow bookshops to imbue theire presence, their stock and the experience they offer with more, not less, value than ever before. Now that would be a turnaround.